How much lotion will you need? Scabies itches like mad. There are two skin lotions/creams that kill scabies mites AND ease itching. They are sulfur lotion and Eurax lotion. Sulfur is cheaper and more powerful than Eurax, but sulfur can dry your skin a little. Eurax does kill scabies mites, but it is not as powerful as sulfur. But Eurax is very soothing. It both softened my skin and eased the itch. I admit I love Eurax lotion — anytime I had an itch I could apply it and relax again. If you have to choose due to money, get sulfur (or permethrin or benzyl benzoate). But if you can afford it, get Eurax, too. More about Eurax on this page. If you order them, sulfur can be on your doorstep tomorrow from Amazon, but the only reliable sources I have found for Eurax are England and Australia and take about 10 days to arrive. Sulfur lotion (or ointment) has been used for thousands of years to treat scabies. It relieves itching while it kills scabies. I made mine by mixing concentrated Nu-Stock sulfur ointment with baby lotion. NuStock Ointment in 12-ounce tubes goes for around $12. They call it an "ointment" but it feels just like skin lotion (it is not greasy). It mixes really well with baby lotion ($3 for 27 oz at Wal-Mart!) to make whatever percent ointment you want. If you are hyper-sensitive to sulfur smells, move along. Personally I like a mild smell of sulfur, like from fireworks. So for those who want a more "natural" sulfur treatment, this is what 87% of 1,200 Amazon reviewers say worked to rapidly cure their pets' parasite problems. If you read the reviews, you'll see I'm not the only one to use it to treat scabies on humans. Nu-Stock is 73% sulfur, 25% mineral oil, 2% pine oil, so don't use it straight out of the tube. 10% is strong enough to cure scabies, and I found it very gentle and soothing. A similar product is called Allhide contains 74% sulfur, plant-based glycerol and pine oil. Use the recipe below to mix it down to 10% sulfur. If you prefer a pre-mixed sulfur lotion/ointment, look at the bottom of this page for a few great product suggestions. ﻿One ﻿tube ﻿of ﻿Nu-Stock ﻿mixed ﻿with ﻿baby ﻿lotion ﻿makes ﻿over ﻿2 ﻿quarts ﻿of ﻿10% ﻿lotion! ﻿Of ﻿course ﻿you ﻿can ﻿mix ﻿up ﻿smaller ﻿amounts. ﻿The ﻿latest ﻿research ﻿(here ﻿and ﻿here) ﻿on ﻿using ﻿sulfur ﻿lotion ﻿to ﻿treat ﻿scabies ﻿has ﻿used ﻿either ﻿8% ﻿or ﻿10% ﻿sulfur ﻿ointment ﻿successfully. ﻿Do ﻿not ﻿use ﻿the ﻿Nu-Stock ﻿straight ﻿out ﻿of ﻿the ﻿tube ﻿because ﻿73% ﻿sulfur ﻿is ﻿too ﻿strong ﻿for ﻿humans ﻿(it's ﻿fine ﻿for ﻿cows ﻿and ﻿horses)! ﻿Dilute ﻿it ﻿using ﻿the ﻿recipes ﻿(above). ﻿8% ﻿and ﻿10% ﻿is ﻿the ﻿strength ﻿used ﻿in ﻿studies. ﻿The ﻿sulfur ﻿ointment ﻿needs ﻿to ﻿be ﻿applied ﻿for ﻿three ﻿days ﻿in ﻿a ﻿row, ﻿either ﻿once ﻿a ﻿day ﻿for ﻿twelve ﻿hours ﻿each ﻿time ﻿(like ﻿overnight ﻿while ﻿you ﻿sleep) ﻿OR ﻿by ﻿applying ﻿it ﻿once ﻿a ﻿day ﻿and ﻿leaving ﻿it ﻿on ﻿for ﻿24 ﻿hours. ﻿In ﻿both ﻿studies ﻿the ﻿subjects ﻿showered ﻿once ﻿a ﻿day. ﻿Leaving ﻿it ﻿on ﻿12 ﻿hours ﻿(each ﻿day ﻿for ﻿three ﻿days) ﻿resulted ﻿on ﻿a ﻿90% ﻿cure ﻿rate. ﻿Leaving ﻿it ﻿on ﻿24 ﻿hours ﻿(each ﻿day ﻿for ﻿3 ﻿days) ﻿resulted ﻿in ﻿a ﻿96% ﻿cure ﻿rate. ﻿In ﻿case ﻿you're ﻿wondering, ﻿that ﻿small ﻿difference ﻿means ﻿doing ﻿it ﻿for ﻿just ﻿12 ﻿hours ﻿a ﻿day ﻿is ﻿fine. ﻿Those ﻿who ﻿applied ﻿it ﻿for ﻿the ﻿full ﻿24 ﻿hours ﻿reported ﻿a ﻿bit ﻿more ﻿skin ﻿irritation ﻿and ﻿you ﻿do ﻿need ﻿to ﻿be ﻿good ﻿to ﻿yourself. ﻿You ﻿may ﻿have ﻿to ﻿wait ﻿4 ﻿days ﻿and ﻿then ﻿repeat ﻿this ﻿just ﻿to ﻿be ﻿to ﻿be ﻿sure ﻿to ﻿kill ﻿any ﻿eggs ﻿that ﻿hatch ﻿after ﻿the ﻿first ﻿treatment. ﻿You ﻿can ﻿always ﻿use ﻿sulfur ﻿lotion ﻿one ﻿week, ﻿and ﻿then ﻿5% ﻿permethrin ﻿lotion ﻿the ﻿next ﻿week. ﻿I ﻿have ﻿used ﻿sulfur ﻿lotion ﻿and ﻿aside ﻿from ﻿smelling ﻿a ﻿bit ﻿(I ﻿actually ﻿liked ﻿the ﻿mild ﻿sulfur ﻿aroma), ﻿it ﻿was ﻿actually ﻿soothing. ﻿It ﻿warmed ﻿my ﻿skin ﻿in ﻿bed ﻿at ﻿night ﻿and ﻿somehow ﻿that ﻿stopped ﻿the ﻿itching ﻿so ﻿I ﻿could ﻿sleep. ﻿I ﻿also ﻿took ﻿ivermectin ﻿at ﻿the ﻿same ﻿time, ﻿so ﻿it's ﻿hard ﻿to ﻿say ﻿which ﻿did ﻿what, ﻿but ﻿the ﻿10% ﻿sulfur ﻿lotion ﻿(plus ﻿5% ﻿permethrin ﻿once ﻿a ﻿week) ﻿is ﻿what ﻿finally ﻿finished ﻿off ﻿my ﻿stubborn ﻿scabies. ﻿A ﻿tube ﻿of ﻿NuStock ﻿contains ﻿12 ﻿ounces ﻿— enough ﻿to ﻿make ﻿two ﻿and ﻿a ﻿half ﻿quarts ﻿(84 ﻿ounces) ﻿of ﻿10% ﻿sulfur ﻿lotion ﻿(after ﻿you ﻿add ﻿the ﻿skin ﻿lotion). ﻿That's ﻿a ﻿LOT ﻿of ﻿lotion! ﻿How ﻿much ﻿lotion ﻿will ﻿you ﻿need? ﻿If ﻿you ﻿are ﻿just ﻿using ﻿it ﻿now ﻿and ﻿then, ﻿here ﻿and ﻿there, ﻿for ﻿itch ﻿relief, ﻿you ﻿can ﻿try ﻿a ﻿small ﻿amount. ﻿It ﻿takes ﻿about ﻿3 ﻿ounces ﻿to ﻿cover ﻿your ﻿whole ﻿body ﻿(depending ﻿on ﻿how ﻿big ﻿you ﻿are). ﻿If ﻿are ﻿using ﻿it ﻿as ﻿your ﻿primary ﻿scabies ﻿treatment, ﻿you ﻿apply ﻿it ﻿3 ﻿nights ﻿in ﻿a ﻿row, ﻿that's ﻿about ﻿8 ﻿or ﻿9 ﻿ounces ﻿per ﻿week. ﻿For ﻿most ﻿folks ﻿you ﻿do ﻿this ﻿2 ﻿weeks ﻿in ﻿a ﻿row, ﻿so ﻿that's ﻿18 ﻿ounces. ﻿For ﻿a ﻿stubborn ﻿case ﻿you ﻿may ﻿apply ﻿it ﻿weekly ﻿for ﻿5 ﻿weeks, ﻿that ﻿comes ﻿to ﻿45 ﻿ounces ﻿or ﻿1.4 ﻿quarts. ﻿Obviously ﻿for ﻿treating ﻿a ﻿family ﻿making ﻿your ﻿own ﻿becomes ﻿an ﻿attractive ﻿option. ﻿If ﻿you ﻿want ﻿to ﻿buy ﻿pre-mixed ﻿sulfur ﻿lotion/ointment, ﻿here ﻿are ﻿a ﻿few ﻿products ﻿to ﻿choose ﻿from ﻿(below). ﻿Mixing ﻿Nu-Stock ﻿sulfur ﻿lotion ﻿or ﻿sulfur ﻿powder ﻿with ﻿baby ﻿lotion ﻿is ﻿a ﻿lot ﻿cheaper, ﻿but ﻿obviously ﻿pre-mixed ﻿lotion ﻿is ﻿a ﻿lot ﻿tidier! Io, one of Jupiter’s moons. 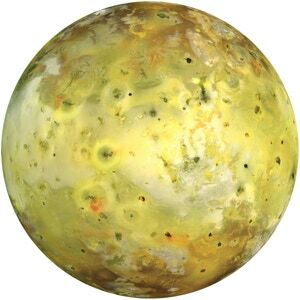 Most of Io's surface is coated with sulfur and sulfur-dioxide frost. There are no known scabies mites on Io. Nu-Stock is mixes easily with lotion. Allhide can be mixed with lotion using the same recipe as with Nustock. The main difference is Allhide contains glycerol while NuStock contains mineral oil (baby oil). 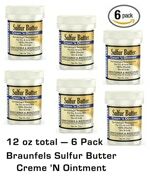 ﻿I ﻿was ﻿thinking ﻿about ﻿making ﻿my ﻿own ﻿line ﻿of ﻿10% ﻿sulfur ﻿products ﻿until ﻿I ﻿saw ﻿Braunfels ﻿stuff. ﻿Braunfels ﻿makes ﻿their ﻿products ﻿the ﻿way ﻿I ﻿would, ﻿using ﻿the ﻿kind ﻿of ﻿high-quality ﻿ingredients ﻿I ﻿would ﻿choose…so ﻿now ﻿I ﻿don't ﻿have ﻿to! ﻿Braunfels ﻿Labs ﻿makes ﻿specialty ﻿sulfur ﻿products…and ﻿they ﻿go ﻿all ﻿the ﻿way ﻿ensuring ﻿their ﻿products ﻿are ﻿natural ﻿and ﻿organic. ﻿The ﻿ingredients ﻿are ﻿more ﻿expensive ﻿than ﻿the ﻿synthetic ﻿stuff ﻿in ﻿most ﻿skin ﻿lotions ﻿and ﻿so ﻿it ﻿is ﻿pricier, ﻿but ﻿not ﻿ridiculous. ﻿You'll ﻿need ﻿about ﻿8 ﻿or ﻿9 ﻿ounces ﻿to ﻿do ﻿3 ﻿applications ﻿over ﻿3 ﻿days. ﻿They ﻿use ﻿a ﻿blend ﻿of ﻿"premium" ﻿"American" ﻿sulfur ﻿with ﻿an ﻿organic ﻿cocktail ﻿of ﻿pure ﻿oils ﻿- ﻿Avocado ﻿Oil, ﻿Hemp ﻿Oil, ﻿Jojoba ﻿Oil ﻿with ﻿Shea ﻿Butter. ﻿They ﻿do ﻿not ﻿use ﻿any ﻿polyethylene ﻿glycol ﻿- ﻿PEG ﻿- ﻿zero! ﻿No ﻿petrolatum ﻿products,period. ﻿Also, ﻿no ﻿fragrance, ﻿no ﻿dyes, ﻿no ﻿artificial ﻿colorings, ﻿no ﻿perfume. ﻿This ﻿"butter ﻿cream ﻿'n' ﻿ointment" ﻿is ﻿made ﻿with ﻿shea ﻿butter ﻿mixed ﻿in ﻿other ﻿natural ﻿oils ﻿to ﻿make ﻿it ﻿creamier. ﻿Shea ﻿butter ﻿is ﻿a ﻿natural, ﻿organic ﻿oil ﻿that ﻿is ﻿relatively ﻿solid ﻿at ﻿room ﻿temperature, ﻿but ﻿it ﻿softens ﻿on ﻿your ﻿warm ﻿skin. ﻿You ﻿can ﻿always ﻿pre-soften ﻿it ﻿with ﻿a ﻿few ﻿seconds ﻿in ﻿the ﻿microwave ﻿(lid ﻿off) ﻿or ﻿by ﻿putting ﻿it ﻿in ﻿warm ﻿water ﻿for ﻿a ﻿few ﻿minutes ﻿(lid ﻿on). ﻿Of ﻿course, ﻿lots ﻿of ﻿people ﻿are ﻿mighty ﻿picky ﻿about ﻿skin ﻿lotion. ﻿What ﻿one ﻿person ﻿loves ﻿another ﻿one ﻿hates, ﻿so ﻿if ﻿you ﻿mix ﻿up ﻿NuStock ﻿ointment ﻿or ﻿Braunfels ﻿powder ﻿or ﻿Greenway ﻿Biotech ﻿powder ﻿with ﻿your ﻿own ﻿favorite ﻿skin ﻿lotion ﻿you ﻿can ﻿virtually ﻿guarantee ﻿you'll ﻿like ﻿the ﻿feel ﻿of ﻿it. Mix 1 ounce by weight (or 3 tablespoons) of powder with 9 oz of skin lotion to make a total of 10 oz of 10% sulfur lotion. NOTE: you can measure the lotion by weight or volume. Plus you can use whatever lotion or cream you like. You can mix 1 oz by weight (or 3 tablespoons) of the sulfur powder with 1 cup (8 oz) of lotion and make an 11% sulfur lotion. It’s easier to measure that way and you probably can’t tell the difference between 10% and 11% lotion. They’ll both work. Put the lotion in a ziplock bag. Add the sulfur powder. Press out the excess air and seal the bag. Now just mush the lotion and powder around with your hands and you’re done!